Created by Heiko Braun on Jul 21, 2010 9:55 AM. Last modified by Mike Brock on Mar 24, 2011 2:39 PM. This document describes the steps necessary to setup an eclipse project in order to work with GWT, CDI and Errai. It leverages the CDI integration which is part of project Errai. NOTE: Make sure to check the latest version of the userguide as well. bare bone project, including all dependencies, which can later on be imported in eclipse. Customize the build properties according to your needs. The archetype will be created in a directory that equals the artifactId. Great. Now we have fully working build environment setup in a few, simple steps. You could already use it launch the GWT hosted mode or to package your webapp. Next we'll import this project into eclipse. 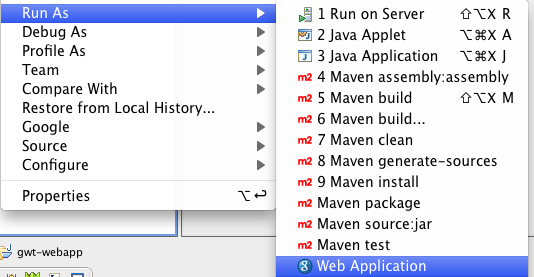 We assume the maven eclipse plugin is successfully installed. In a next step we need to enable the GWT for our project and customize the launch configuration. (creates a default run configration) and then modify it afterwards. If you now launch the custom configuration, it will bootstrap a CDI environment, deploy all beans and make them available to your GWT frontend. Point your browser to http://127.0.0.1:8888/App.html?gwt.codesvr=127.0.0.1:9997 and start hacking.